The Stelten Handrail fixing is a simple and reliable fixing offering a great deal of flexability. 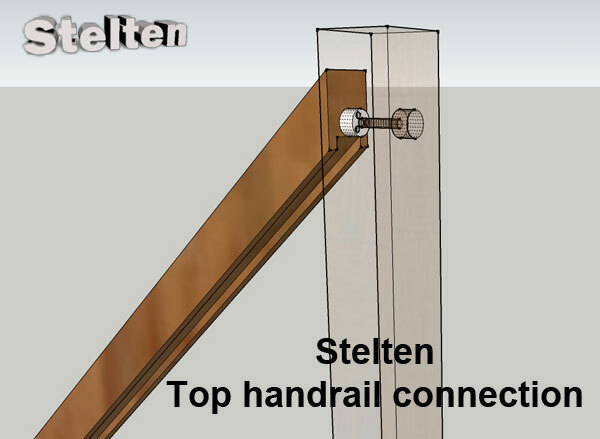 Stelten is short for Steel Tenon, this steel tenon simply screws on to the end of a handrail giving you a round tenon. 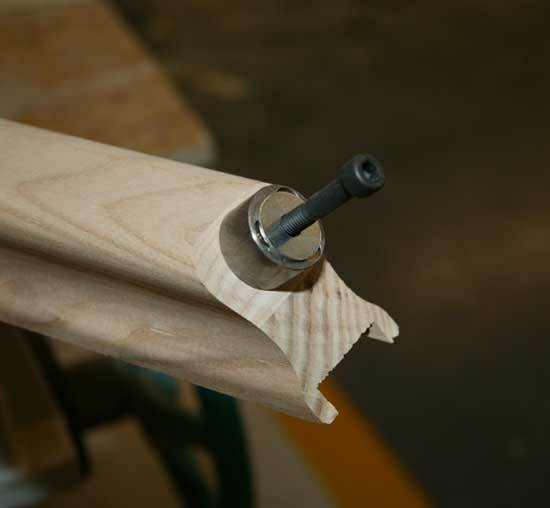 A Round tenon enables to mortice to be formed easily with a drill, steltens are 30mm in diameter. To complete your fixing you need to drill another hole in the opposite side of the post to enable you to bolt through the post into the stelten, this hole is then filled with a pellet. 30mm Pellets are available in Pine , Oak , Hemlock and Sapele. 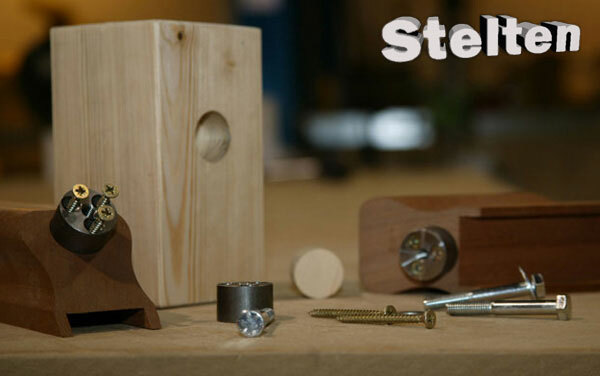 Stelten fixings have 3 holes in for the fixing screws these are strategicaly placed to enhance strength. When it comes to screwing on your stelten fixings to the handrail position the stelten at the top of the cut on a bottom cut and on the bottom of the cut on a top cut this will give you more timber enabling you to use longer screws. It is also recommended to recess the stelten into the handrail itself by 2mm this will increase the shear factor achived. 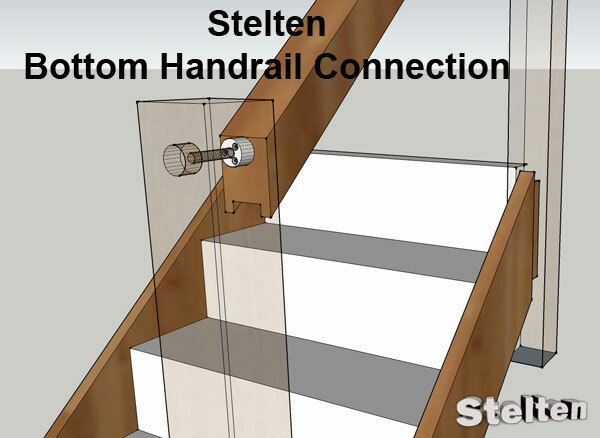 Stelten was developed by Stairplan for fixing our handrails, The system offer a fast easy solution to a normaly time consuming task of Tenoning the end of your handrails, The fixing also has uses on many other areas where a simple joint is required. Stelen is only available through Stairplan prices can be found on our online store under accessories. 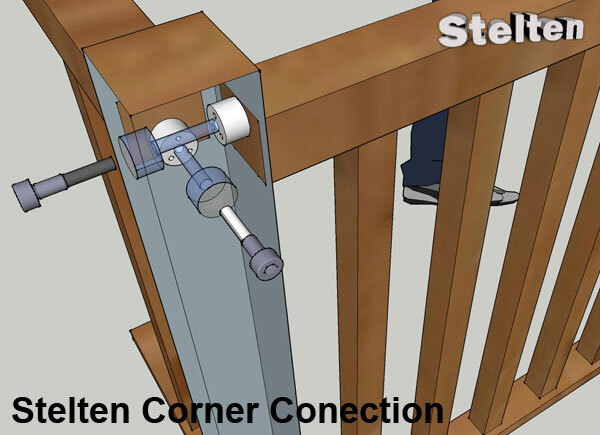 A common question is how do the fixings work when you have a corner landing connection, here you can see you simply screw one stelten towards the top of the one handrail and towards the bottom of the other handrail. On the bottom connection screw the stelten fixing close to the top of the cut, this gives you the maximum amount of timber to fix the stelten to the handrail allowing longer fixings to be used. On the top cut screw the stelten fixing close to be bottom of the cut again this gives you the maximum amount of timber to screw into when fixing the stelten to your handrail.